Osteoarthritis is a degenerative joint disease which is the most common form of arthritis.Since arthritis is typically characterized by stiffness, swelling and pain in the sufferer’s joints, Osteoarthritis leads to knee pain and a gradual loss of mobility, and makes it difficult for the sufferers to carry out their day-to-day tasks. Herbal treatment for Osteoarthritis is extremely effective in dealing with the disease as it can provide relief from knee pain and discomfort. The key reason for the occurrence of Osteoarthritis is the breakdown and wearing away of the articular cartilage between the bones and the joints. The cartilage is made of substances like collagen which lend flexibility and strength to the connective tissue, and it basically serves as a ‘cushion’ between the bones. As a result of the wearing away of the cartilage, bones start rubbing against each other. This condition deteriorates over time, and affects the shape and functionality of the sufferer’s joints, thus leading to unbearable pain in the knees. Some of the most common causes for the occurrence of Osteoarthritis knee pain are: genetic factors, obesity, injury, infection, rigorous exercise, and other health problems like diabetes, gout, uric acid build-up, and autoimmune disorders. 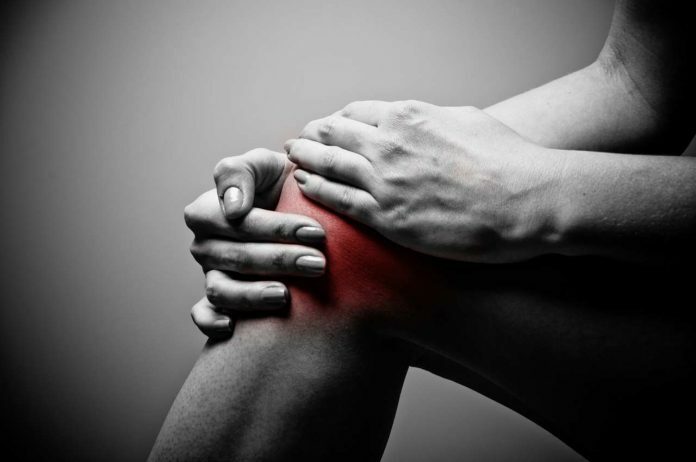 Osteoarthritis knee pain mostly affects people in the older age group. With natural remedies and herbal treatment for Osteoarthritis, muscles around the knee joints can be made strong, so that they become more flexible and provide support to the joints. Altogether, natural remedies for Osteoarthritis are aimed at easing the knee pain for the sufferers and improving their mobility. Ginger is an excellent natural remedy for Osteoarthritis because it is abundant in chemicals which have analgesic and anti-inflammatory properties. Natural ginger extract from Zingiber officinale plant is very effective in reducing joint pain linked to the disease, along with keeping the gut/digestive system healthy. Ginger extract can specifically slow down the stimulation of several genes — like genes encoding cytokines– which are involved in the inflammatory response; and can thus lessen the severity of Osteoarthritis knee pain. Turmeric has a number of active ingredients, the most important one being ‘Curcumin.’ This active ingredient in turmeric is a potent natural anti-inflammatory component and is known for managing the painful symptoms of arthritis and joint pain. The use of turmeric by Osteoarthritis patients can control the inflammation of knee joints, reduce pain and swelling, and even slow down periarticular joint destruction. It can be used with milk or honey or plain water. The use of certain herbs comprises an effective herbal treatment for Osteoarthritis knee pain. The herbs, other than Zingiber officinale, which have potential anti-arthritic properties include nirgundi (vitex negundo), shallaki (boswellia serrata), ashwagandha (withania somnifera), and guggul (commiphora mukul). These herbs can control pain and inflammation, particularly painful joints in patients suffering from Osteoarthritis. Joint pain and inflammation in Osteoarthritis can also be reduced with the intake of Omega-3 foods. Some of the foods abundant in Omega-3 fatty acids are certain fish like salmon tuna and mackerel; as well as flax seeds, walnuts, and chia seeds. High-fiber foods including vegetables, fruits, soaked legumes/beans, and ancient grains are very beneficial in managing the painful conditions of Osteoarthritis. Green leafy vegetables, cruciferous veggies, bananas, blueberries, melon, pineapple, papaya, and avocado are abundant in antioxidants, fiber, Vitamin A, Vitamin C, magnesium, potassium, digestive enzymes and anti-inflammatory compounds. Green tea is also a useful natural remedy for Osteoarthritis knee pain because it is rich in compounds called ‘polyphenols’ which are helpful in reducing inflammation. Green tea can also protect the articular cartilage by inhibiting chemicals and enzymes which can cause cartilage breakdown. Some herbal oils can also be used topically on the painful joint areas for managing Osteoarthritis knee pain. Warm mustard oil with crushed cloves of garlic, olive oil, and coconut oil or nirgundi oil are commonly available and efficient for the massage. Finally, along with the natural remedies and herbal treatment for Osteoarthritis, this disease can be effectively managed by paying attention to some other crucial factors like consuming an unprocessed, nutrient-rich diet; reducing stress levels; and maintaining a healthy weight with the help of exercises such as walking, cycling, swimming, and yoga.